Thank you so much for visiting my blog and leaving such a lovely comment. I'm so happy you did, especially because it led me to yours. I had such fun skimming through your stories. I'm afraid I don't have a lot of time right now just because I'm losing my mind with getting ready for the movers who are coming on Thursday. Arrrrghhh... I had to laugh reading about the many shoes. After 34 years, have we got the shoes!!! I see so many other postings that you've written that I really want to come back and spend more time with your blog site. Thanks again. i disposed of at least 10 pairs of my shoes recently and would have to cut the number even more. How ironic that you would post on shoes today. My daughter and I were discussing shoes yesterday and discovered we share a friend who has between 50 & 60 pairs of shoes. I was shocked to think that a regular person could possibly own that many shoes. So I stopped for a moment and check out my shoe wardrobe. Having problematic feet, I can't wear any of the lovely high heels that many women wear, so my shoes are limited to flats and believe it or not I actually have 16 pairs of shoes and sandles. This post gave me pause to think ..... do I really need that many pairs of shoes to get me around day to day???? Musings, your blog is wonderful and I look forward to reading more when you get settled again. I really appreciate you coming by here. Polona, Yes, the seasons too... we really do need them all. But it still doesn't make sense, how to get out of that loop. Or is that just life, I wonder. Well done to you for at least getting rid of 10 pairs. Barb, I think the sad answer is yes we do- the trick is perhaps to change lifestyle just a little so that the answer gradually turns into 'no.' But right now I can't see a way to get rid of them- especially since every pair is for practical use and not because I/we think they look good, which would conveniently divide them into necessary and not necessary. No such luck though. How strange that we were both thinking of shoes- and it's not something I do often. I can't imagine 60 pairs but I can see how it might happen without much trouble. shoes! I have been planning a shoes post for some time now but hadn't quite gotten to it--I think you've pushed me to pull it together tonight. I share your dislike for shoes and shoe shopping. But you are right..we can't wear one pair of shoes to every place or event we go to. I wish I could wear my slippers and flip flops everywhere...without being laughed at. i culled severely last fall, but i'm sure the situation is still dire. and i just made it worse by buying 2 new pairs last week. the sunshine made me do it. Pauline, Oh dear, the shoe rack has probably made things worse for you... they promise help in being organised but they just make a bigger mess, it seems. Julie, "the sunshine made me do it." The sunshine... hmm... okay. Accepted excuse. You did try, after all... culling is essential. I don't doubt you've seen worse- after all we're not clothes or shoe people at all so if it's bad for us... I can't imagine how it is for real shoe enthusiasts. I am a recovered shoe addict. I probably still have more shoes than I ought to or need, but only because of being sentimentally attracted to a few of them. oh my another idea for a thursday theme!! !if anything it will get me to collect all my shoes together and actually count how many pair I have! Kimy, see, I'm free of the sentimental part, at least. That's a lucky thing for me. I anxiously await your shoe counting. Or- how about a contest on your blog- whoever guesses the right number of shoes you have, is the winner... maybe the prize could be every shoe you own. Nice post!! I like your writing skill. Well, I also have some of the pairs of shoes like them. I'm afraid I can't participate in the culling/discarding shoes story. I don't know where my shoe fetish came from but I still have shoes that I have never worn, that are "waiting" for the right outfit to come along. I actually don't mind my shoe obsession although it does get me some ribbing from The Boy on occasion. However, I can smile and thank you for reminding me of the numerous dollhouses and dioramas that I made with any shoe box I could find! Those were more fun than any storebought toy I had in my closet. Ami, thank you! I appreciate your words. Tangobaby, yes, I used to love to make houses out of the boxes too. You must also have good walking shoes, for where you live ;) I'd never stop walking if I lived there. Well we all have our obsessions, I think... I have books I haven't read (as does everyone) and lots of things- but no shoes. I think I use them all at least once a year. I am positive I would have more shoes than you do. With three girls, twins and wife, they tend to pile up. Around our house shoes are like socks in the wash - you can never seem to find the mates. Part of the danger for shoe collectors is when you live in a place where footwear purchasing options abound. I'm sure I wouldn't be nearly this bad if I lived somewhere I wasn't put in the direct path of temptation. Steve, Yes- I lost a sock just three days ago. Two went into the dryer and one came out. 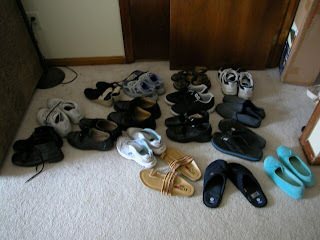 I've never lost a shoe but I can understand how pairs get split up like that when there's so many! Tangobaby, you talked before about moving to Ireland- there's your motive! But the Mater might drag you to shoe stores for company... beware. We mentioned this before- when you said you didn't move far away enough! My closet is also full (well, a huge box next to it, since I haven't unpacked them). I only buy a pair a year, but I never throw them out! Kip, yes, they add up after some years! Be careful. Or you might open your closet one day like I did, thinking you 'only buy one pair' and... they'll hit you one by one.